Karst Worlds: Ebook: Jules Verne's "A journey to the center of the earth"
Ebook: Jules Verne's "A journey to the center of the earth"
For his 138th birthday I present you the ebook of the Jules Verne classic "A journey to the center of the earth". You can download it for free here (multiple formats available, including audiobook). 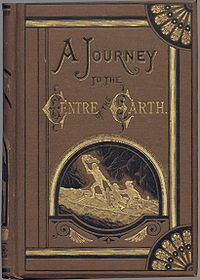 A Journey to the Center of the Earth is a classic 1864 science fiction novel by Jules Verne. The story involves a German professor (Otto Lidenbrock in the original French, Professor Von Hardwigg in the most common English translation) who believes there are volcanic tubes going toward the center of the Earth. He, his nephew Axel (Harry), and their guide Hans encounter many adventures, including prehistoric animals and natural hazards, eventually coming to the surface again in southern Italy. The book has been filmed in 2008 by Eric Brevig and is starring Brendan Fraser as leading actor.